Amazon Kindle Fire HDX 7-inch review: Can this all-new Android tablet beat the likes of the iPad Mini Retina and Google Nexus 7? The Amazon Kindle Fire HDX is the brand-new tablet from the company that arguably started the eReader craze with the original Kindle. Since then Amazon has faced increasing rivalry, not least from the arrival of affordable, powerful Android tablets such as the new Google Nexus 7, and then of course there's Apple's own take, the iPad Mini Retina. Despite this the company has continued to thrive against the unending competition. Of course it helps that Amazon's own media content offerings are on par with Apple's and arguably better than Google's. Amazon's confidence in its content is evident in the Kindle's business model which makes a loss on the hardware but instead makes back all the profits thorugh content consumption. It's a brave move that appears to have paid off and Amazon clearly has plans to stick by it. This approach is even more evident in this latest range with the flagship Kindle Fire HDX, a 7-inch replacement to the original Kindle Fire, which boasts an above-HD display and powerful quad-core innards. The first thing you'll notice when you pick up the Kindle Fire HDX is the immediate change in design, instead of the smooth matte surfaces you'd find on the original Kindle Fire, the HDX is all angles and contrasts with a smooth matte back now joined with a glossy metallic top containing the speakers. It's a bold look and we like it. The angular design helps give the appearance of the HDX being much thinner than it actually is (9mm if you're wondering). It's also pretty light, weighing just 311g, ok so it's not as light as the new Nexus 7 but it's still more than easy enough to hold in one hand and watch movies. On the back you'll find that Amazon has taken a similar approach to the LG G2, as the HDX's power and volume buttons are actually on the back of each side rather than protruding out the side. It takes a bit of getting used to but eventually we got the hang of it and after a few days you won't even notice the difference. This is where the 'HDX' comes in. Amazon has fitted the new Kindle Fire with its all-new 'HDX' display which gives an impressive screen resolution of 1920x1200 at 323ppi on the 7-inch screen (there's also an 8.9-inch version available). While you may have seen higher pixel densities elsewhere, Amazon has what it believes is an ace card ast the Kindle Fire HDX has 100% sRGB colour accuracy. It's an impressive feat and you'll notice the difference straight away. Movies look fantastic while images are rich and vibrant. The easiest way of describing it is by taking an image, pressing the 'enhance' button and then viewing everything through that filter. Sadly though, there is a catch. To create this perfect colour reproduction Amazon had to make some changes to the way it built its display. Normally companies would use white LEDs to backlight their displays, however in order to gain the perfect colour balance Amazon has decided to use blue LEDs instead. What this means is that when viewing large white screens such as web pages or books you'll notice the faintest blue tint bleeding in around the display. We really do mean faintest, it's barely noticeable, but for those that are going to spend as much time reading as they are looking at films it might be something to note as we certainly noticed it straight away and it did bug us after a while. The Amazon Kindle Fire HDX is in fact an Android tablet, albeit one that's heftily disguised, so disguised in fact that you'll be hard pressed to find any evidence of it at all. Instead Amazon callsl the software Fire OS, and in this case the HDX comes running Fire OS 3.0 'Mojito' which, among a number of features, offers the revolutionary new 'Mayday' service. Well publicised before the tablets' launch, 'Mayday' is a revolutionary new tech support solution which means you can connect in real-time via one-way video to a tech support advisor who can connect to your tablet, show you around, draw on the screen and generally help you with any problems you have. To try and combat any privacy fears Mayday calls are strictly one-way which means that while you can see them, they can't see you and at any point you can ask them to sever the connection between them and your tablet. It's a universal truth that all of us at one point or another has been stuck on the phone for 20 minuntes listening to some awful rendition of 90s pop so it's not too difficult to explain just how much of a leap forward this is. We did have a few teething problems initially with dropped calls and at one point a complete refusal to connect but it's important to note that we were reviewing the product before it had officially gone live, including the army of tech assistants that would be helping the UK. Yes that's right, if you buy the tablet in the UK, you'll be speaking to tech assistants from the UK. Taking into account the fact that Xmas is around the corner as well and it'll be an incredible achievement if Mayday launches without any major hiccups. Elsewhere you'll find that Amazon has included an updated version of its Silk browser and a new dedicated Email app which is very welcome indeed. Sadly though this is where the good news ends: while Amazon's own services; Silk, Lovefilm, Kindle etc are incredibly well thought out and polished the rest of Amazon's app store is strictly controlled which means the chaos of choice found on Google Play is nowhere to be seen here. What this essentially means is you won't find YouTube, Google Drive, Google Maps or even Google Music, instead Amazon is hoping you'll commit to their own content providers. Thankfully this isn't such a compromise as Amazon has some of the best content available thanks to Lovefilm, Amazon CloudPlayer and of course the bar-setting Kindle store. If you happen to have a Prime membership the offerings get even better with access to over 350,000 titles which you can borrow at your heart content for no extra charge. It's an enticing array of products and if you're in it for the content consumption then the Kindle HDX does not disappoint. If we had any gripes it's with the third-party offerings. Yes you can download Netflix and BBC iPlayer but you can't download any video content for offline viewing and while iPlayer may be updated soon for the moment though it's strictly Wi-Fi only if you plan on watching anything. If there's one area Amazon hasn't skimped on it's the performance. 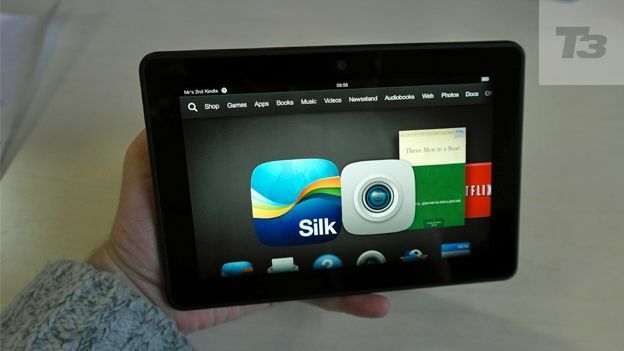 Here the Kindle Fire HDX has been blessed with top-of-the-range hardware. Inside you'll find a 2.2GHz Qualcomm Snapdragon 800 quad-core processor along with 2GB of RAM, which means that games play smoothly whilst video playback is lag-free. Amazon claims that the Kindle Fire HDX has an 11-hour battery life and with mixed-usage we'd have to agree that it's suitably impressive. While we wouldn't go as far as 11 hours you'll certainly be able to get a morning commute, lunchtime read and some email checking inbetween without ever having to worry about plugging in the charger. The Amazon Kindle Fire HDX is Amazon's most powerful tablet yet, boasting specs that can match the Google Nexus 7 and the iPad Mini without even breaking a sweat. It also has that HDX display which means colours look fantastic, and if you can get over the blue tint then you'll never look back. Where the Kindle Fire HDX begins to falter however is in its software, Fire OS is so closed off and finely tuned that it feels as though every button you press is pushing you towards either buying something or diving deeper into Amazon's own services. This gamble thankfully pays of thanks to the biblical amount of content that Amazon has in its possession from Lovefilm to the Kindle store with enough of both to keep a person occupied for life. If you're after more of an all-round performer though the Kindle may not be the tablet for you, and here's why: The Google Nexus 7 costs £199 for the 16GB model, the Kindle Fire HDX 16GB also costs £199 making them equally matched. The problem is, why would you choose the Kindle Fire when you can have a tablet of almost equal specs that offers most of Amazon's own services via the Google Play store while also offering, well, the entire Google Play Store. What it boils down to then is what you're after. If you like being able to tinker, customise and use your tablet as a portable all-in-one, then Android and the Nexus 7 are probably your best bet. If on the other hand you want the simple life and you want a true media player that will give you an almost inexhaustible supply of books, music and video then the Kindle is the tablet for you.